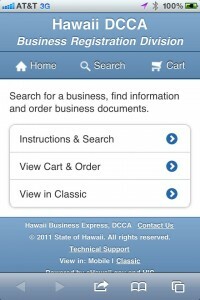 HONOLULU – The Department of Commerce and Consumer Affairs (DCCA) unveiled the State of Hawaii’s first web application for mobile devices. The mobile web app includes a modified version of the current services available on DCCA’s Business Registration website. The web app is designed to make it easier for the public to search a business name, find information, and purchase filed documents or certificates of good standing on devices with smart touch response screens and smaller interfaces. The State’s business registration database, accessible through the mobile web app on an iPad, iPhone, Android or other mobile devices, contains filings dating back to the 1800’s. With larger text, bigger buttons and a clearer layout, the mobile web app makes it easy for the public to get the information they need to do business. 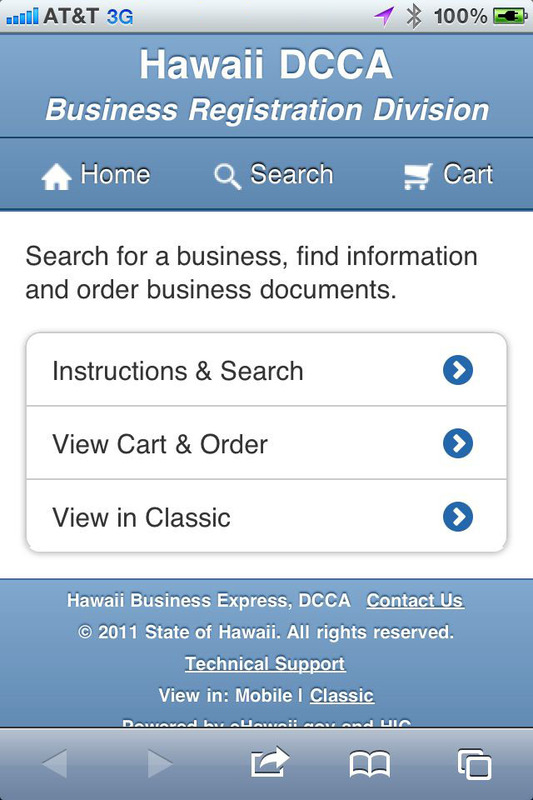 To access the mobile web app, go to business.ehawaii.gov (QR code at right) on your mobile device and a mobile version of the DCCA Business Registration Division website will automatically be displayed. No downloads or installation are required to view the app. If you prefer to use the traditional version of the website that you would find on your laptop or PC, you can select “classic” at the bottom of the page to shift back to the regular website interface. 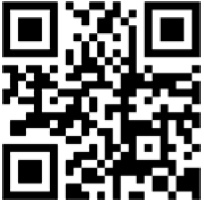 The mobile business search app was developed at no cost and is maintained via the eHawaii.gov program, a largely self-funded public-private partnership between the State of Hawai‘i and Hawai‘i Information Consortium LLC. This partnership has allowed Hawai‘i to deploy award-winning applications such as: Hawaii Electronic Bench Warrants, Statewide Camping Permits, Hawaii Business Express and Online Motor Vehicle Renewals. Hawai‘i Information Consortium also recently redesigned websites for the State Energy Office, Hawai‘i State Judiciary and Hawai‘i County Public Works.